In the bestselling tradition of A Man Called Ove and the beloved film Love Actually comes a quirky, “winsome tale of an unexpected love triangle late in life” (Publishers Weekly) between a socially awkward man—as he goes on a quest to find his wife a last-minute Christmas gift—and the girl who got away. Henry Quantum has several thoughts going through his head at any given time, so it’s no surprise when he forgets something very important—specifically, a Christmas gift for his wife, which he realizes two days before Christmas. Henry sets off in search of the perfect present for her: a bottle of Chanel No. 5 perfume. But much like Henry’s ever-wandering mind, his quest takes him in different and unexpected directions, including running into the former love of his life, Daisy. His wife, meanwhile, unhappy in her marriage, is hiding a secret of her own. And Daisy, who has made the unsettling choice of leaving her husband to strike out on her own, finds herself questioning whether she and Henry belong together after all. An “at times funny, at times profound” (Kirkus Reviews) debut from author Pepper Harding shows how the seemingly insignificant events of one single day can change our lives forever—perhaps, if we’re lucky, for the better. This reading group guide for The Heart of Henry Quantum includes an introduction, discussion questions, and ideas for enhancing your book club. The suggested questions are intended to help your reading group find new and interesting angles and topics for your discussion. We hope that these ideas will enrich your conversation and increase your enjoyment of the book. Middle-management advertising executive Henry Quantum has many thoughts going through his head at any given moment. With his mind racing from physics to philosophy, it’s no surprise that when December 23 comes around, Henry has forgotten to purchase a Christmas gift for his wife, Margaret. He sets off on a quest to purchase the perfect present: a bottle of Channel No. 5 from Macy’s. But diversions abound as he makes his way through the streets of San Francisco, including a surprise encounter with his former lover, Daisy. Margaret, meanwhile, is on her own quest to meet her current lover for a weekday tryst outside the city. And Daisy, newly separated from her husband, finds herself wondering if she and Henry were meant to be together after all. The Heart of Henry Quantum illustrates the difference a day can make when fate steps in. 1. Over lunch, Henry claims that he doesn’t demand anything of Margaret, prompting Daisy to respond, “That’s because you don’t love her.” (pg. 67) Do you think that’s true? Do you think Margaret loves Henry? 2. Henry claims that “this constant monologue, this incessant vocalizing of every moronic scintilla of thought,” had only started after he left Daisy and went back to Margaret (pg. 69). Why do you think that is? 3. How does each of the main characters feel about their extramarital affairs? Do they feel guilty? Why or why not? 4. Henry says Daisy gives him “false hope.” Why does he make this claim, and how does it differ from his relationship with Margaret? How does “false hope” factor into the story and impact the decisions each of the characters make throughout the book? 5. How and why does the balance of power shift over time in Henry’s relationships with Margaret and Daisy? 7. After leaving Henry at lunch, Daisy realizes that she loved Henry, “not for what he did for her but for what he allowed her to do for herself.” (pg. 218–19) How does that compare to his relationship with Margaret? 8. What role does Denise play in the book? Why do you think the author chose to end Denise’s after-hours encounter with Henry without immediately revealing the truth about what happened? How did the outcome compare to what you thought happened? 9. Henry refers to several physics terms throughout the book. How do they help convey the book’s themes? 10. Why do you think the author chose to set the book during Christmastime in San Francisco? How does the city itself impact the events of the day? 11. Why do you think the author chose to include the scene with the bridge jumper? 12. What significance does Chanel No. 5 hold for Henry? 13. Do we have a “right to love?” All the characters are searching for love outside the boundaries of marriage and convention. Is this ethical? What is the author saying about the limits of love? 14. At the end of the book, Henry confronts his future. What do you think happens next? 15. Daisy and Margaret have two very different pictures of Henry Quantum. Which is right? How do we make decisions about others? How do we know our impressions truly reflect who the other person is? 16. Daisy is brokenhearted over Henry. She knows she discarded something precious and feels it can never be reclaimed. Is she right? Do you think it’s possible to recover something that is lost? To begin again? 17. Throughout the book we learn a lot about what’s inside the head of Henry Quantum. 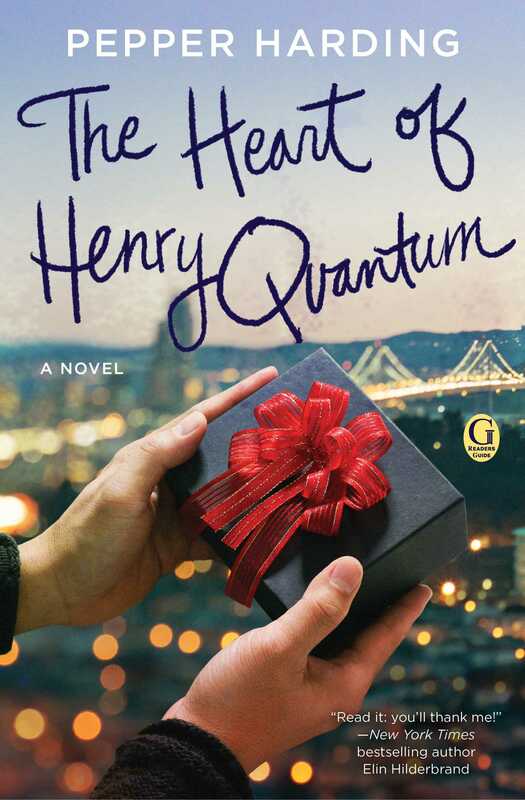 Why do you think the author chose the title The Heart of Henry Quantum? 1. As Henry makes his way through San Francisco, many thoughts come to his mind. Relive Henry’s experience walking through the city by observing a central location in your own community and writing down your thoughts in stream-of-consciousness style. 2. Chanel No. 5 holds particular significance for Henry, just as teddy bears have a particular significance for Daisy. Have each member of the group discuss a special gift or product that has special meaning for them. What do these objects represent for them? 3. Henry enjoys reading Zen koans and offers an example of one in the book. (pg. 81) Look up the definition of a koan, and have each member of the group find an example they like in a book or online to share with the other members of your book club. "In Harding's wry debut fiction... The San Francisco setting is perfectly mapped on the page... Henry's a perfectly sketched character, his interior monologue at times funny, at times profound." "Defying genres...Harding’s debut novel is a fun romp through the streets of the beautiful Golden Gate city... The ending will probably not surprise you, but you will find yourself thoroughly satisfied when you turn the last page." "Especially recommended for holiday reading."